Click the button below to add reminders to your Google Calendar about regular computer maintenance. 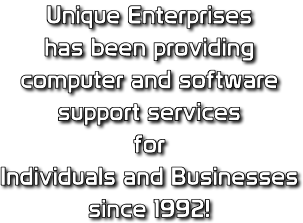 Unique Enterprises was started in 1992 providing computer services for business in the Wichita Kansas area. Since then our mission has stayed the same to provide the best quality and personalized attention to the computer needs of individuals and business. A lot has changed in the computer world since 1992 but our mission of quality customer service and attention to detail has not. Offices are located on main street in Cheney Kansas at 125 N Main, Suite A. Right inside the The Times Sentinel Newspaper building. Unique Enterprises is here to help make computers work for you instead of making it work to use a computer. So whether it's a service call to your home, a computer on the farm that has problems, a business in a small town using software that nobody around has ever heard of before, or connecting multiple locations accross the entire state of Kansas and managing all the pieces to make it work we are here to help you.